I decided to test the coverage of my enlarger lenses by using a piece of acetate transparency and printing on the frame sizes of various film formats up to 5×4″. I used a standard office laser printer to print the diagram below onto transparency. You can download and print your own test negative, but be aware this is sized for A4 paper so be careful if you’re printing onto other formats such as US letter. Check it with a ruler after printing no matter what paper size you’re using, as some printers do “magic” things with resizing. 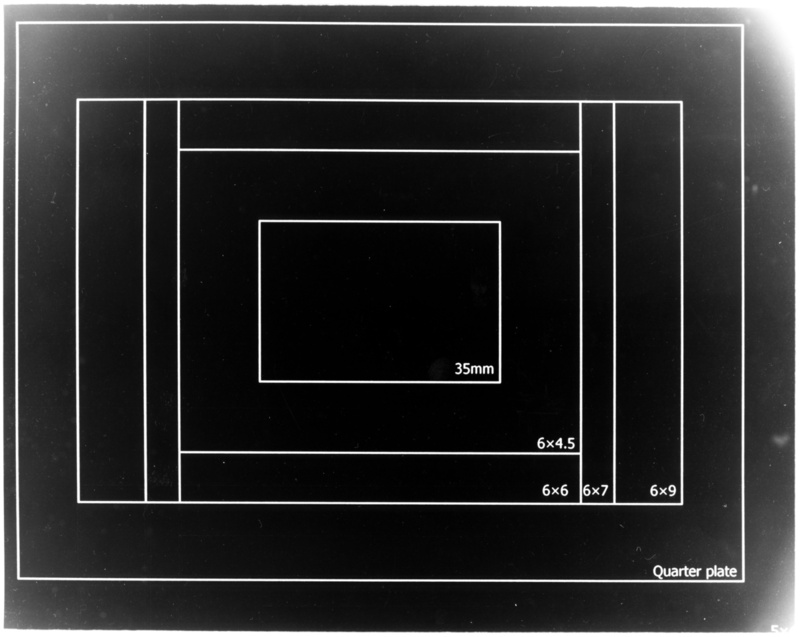 In turn, I focused each lens on the 5×4″ test negative in the carrier and enlarged the result onto a piece of 8×10″ paper. Sorry about the dust and fingerprints – I just chucked these in the flatbed scanner as soon as they had dried. 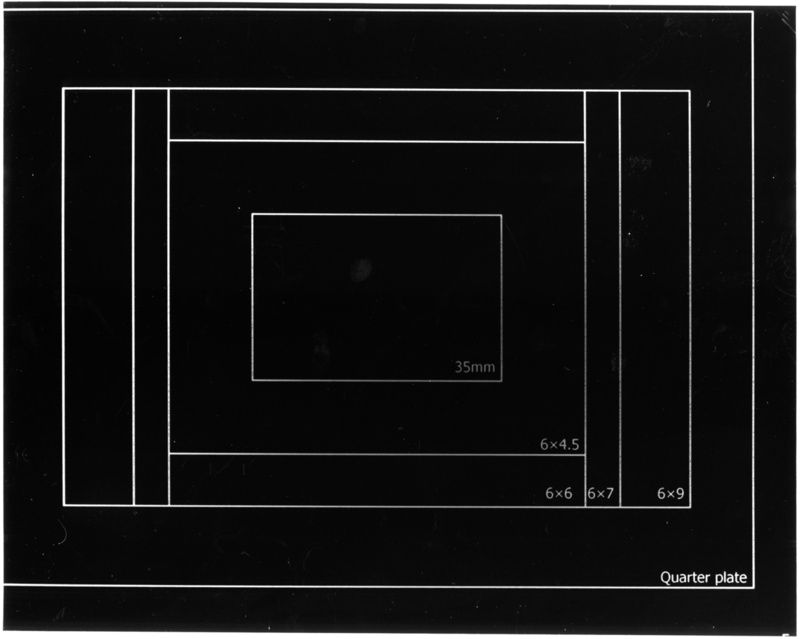 The first thing that jumps out at me is that my test negative was a little too big, and due to the alignment guides in my 5×4″ negative carrier, it wasn’t quite central. If we ignore that, there are a few observations we can make. 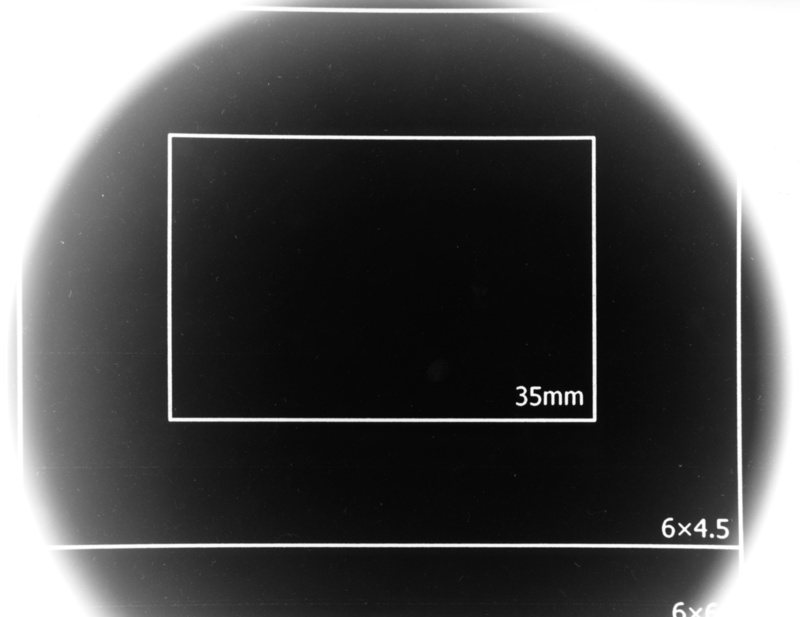 The Schneider Componon-S 50mm easily covers a 35mm negative but vignettes heavily on a 6×4.5 negative. That’s fine, that’s what it’s designed for. The Toshikato 75mm is an unusual lens and not much information is available about it. You might expect it to cover 6×6 but this one easily covers 6×7 and would even cover 6×9 with barely any vignetting if you were careful with the alignment. It does seem to suffer from some pincushion distortion on the 6×9 framelines. The Industar 23U is another pleasant surprise. A cheap Soviet lens but easily covering 6×9 and also covering quarter plate if you are careful with the alignment. However it does suffer from a certain amount of light fall-off before you get to the proper cut-off. The EL Nikkor 135mm is an expected good result. This lens is designed to cover 5×4″ and it does that just fine. 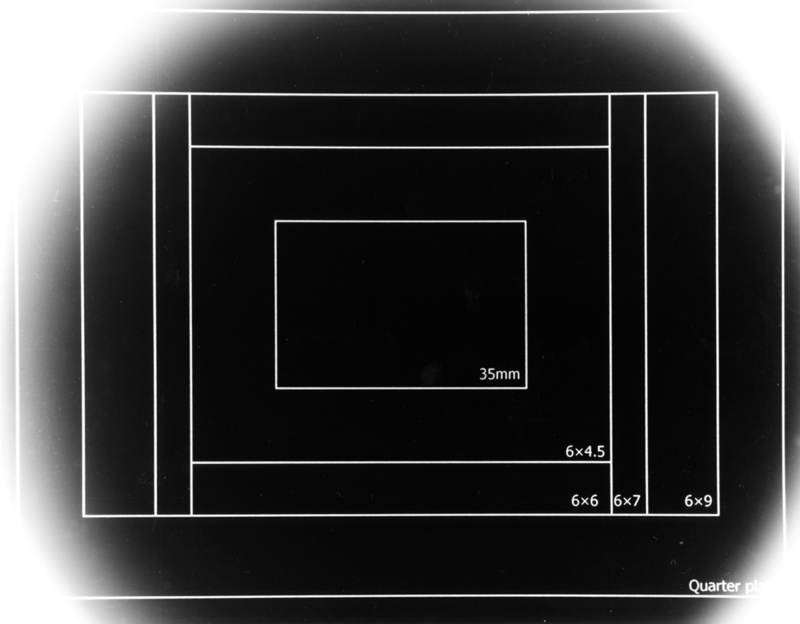 Here, with the full viewable area printed you can see that the negative wasn’t properly aligned in the carrier because it was a little large, which explains why none of these pictures are centred properly. That’s a nice, visual test! thanks! !